Each player receives a game card listing the necessary “Steps to Salvation” and “Other Experiences” that are then checked off as the player lands on the related squares found on the game board. Each player collects all the Steps to Salvation before the game ends. An evangelical Christian would find much on this list to question, but what really stands out is that the Mormon “Steps to Salvation” don’t include Jesus. It’s true that even though Jesus isn’t mentioned by name, these LDS “Steps to Salvation” do include being baptized, which is done in Jesus’ name; making promises about Jesus when one takes the sacrament; and being resurrected because of Jesus’ atonement. But what about having faith in Jesus? What about loving Jesus? What about trusting Jesus? Don’t Mormons need Jesus Himself to be saved? But calling on the name of the Lord is not one of the “Steps to Salvation” that Mormon children are encouraged to take. Even though the Bible says those believing in Jesus are not condemned, and that the world is saved through Jesus, Jesus isn’t to be found in the Mormon children’s game that teaches how to gain salvation. 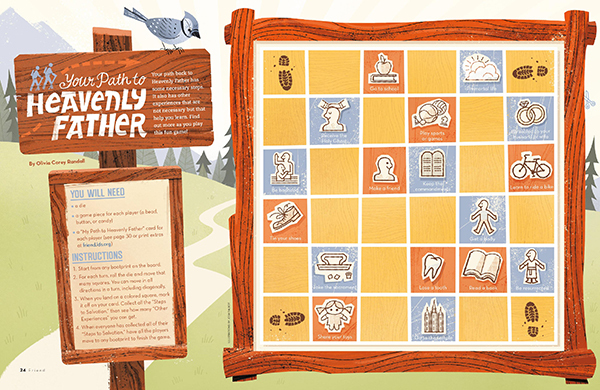 “Your Path to Heavenly Father” is simply a children’s activity; it’s not meant to be an exhaustive lesson on Mormon theology and doctrine. Even so, according to the Bible Jesus is not merely one of several important “Steps to Salvation” — He is to be our focus (“looking to Jesus, the author and finisher of our faith” –Hebrews 12:2), our path (“I am the way…” –John 14:6), and our only access to God the Father (“No one can come to the Father except through me.” –John 14:6). Isn’t it odd, then, that Jesus is absent from the “Path to Heavenly Father” and the Mormon children’s list of “Steps to Salvation”? The Church of Jesus Christ of Latter-day Saints asserts that Mormonism is a Christian religion. But leaving Christ out of salvation, even in a children’s game, is the sort of omission that makes that LDS claim ring hollow.